HENGSION unmanaged EII09-8EP-1F industrial POE Ethernet switch provides 1*100Base-FX fiber optic ports (FC/SC/ST optional) and 8 *10/100Base T(X) POE Ethernet ports. 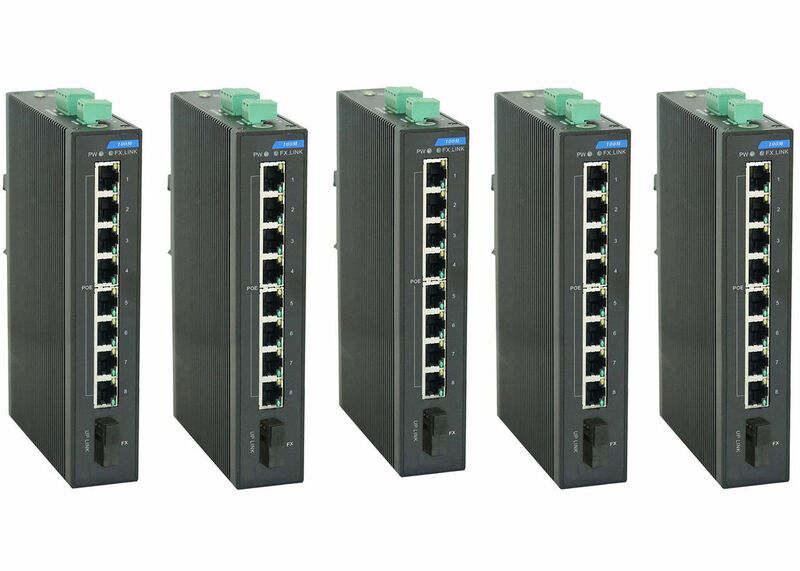 The POE Ethernet ports fully compliant with IEEE802.3af standards, provides 15.4Watts per port; No fan, low power consumption design; Din rail corrugated metal casing, meet IP40 protection grade; Dual redundant power input; Comply with CE, FCC and ROHS standards. Its wide operating temperature range and port surge protection design are ideal for application in large flow real-time outdoor environment, and are widely used in industrial automation control and surveillance occasions like campus, community, rail traffic, electric power control and so on. ▲ POE Ethernet ports fully compliant with IEEE802.3af standard, provides 15.4 Watts per port. ▲ Wire speed forwarding capability of all ports make sure of non-blocking message forwarding. ▲ Redundant power input, with overload protection and power reverse polarity protection. ▲ Support full-loaded operating temperature range -30 to 70℃. ▲ No fan, low power consumption design. ▲ Din rail corrugated metal casing, meet IP40 protection grade.